Roman Nemo Thompson was christened during the flooding chaos at the weekend in Lancaster. A Lancaster couple christened their baby boy against the odds as the city was hit by floods – naming him Nemo. Roman Nemo Thompson was christened by candlelight on Sunday as flooding left thousands without power. Roman was born on September 6 at the Royal Lancaster Infirmary and his name was chosen due to the family’s Polish heritage and his father’s love of sealife. Mum Susannah said: “Our son is called Roman Nemo and everyone lived up to the Disney film’s message and just kept swimming! “I chose Roman because my mum’s Polish and it’s a name we both liked. My husband, Chris, chose Nemo because he is a fish fanatic and has a number of tanks, nothing to do with the flooding though. The name Nemo has an aquatic theme because of the fish star of Disney cartoon Finding Nemo and the character Captain Nemo from the book 20,000 Leagues Under the Sea. Roman was christened at St Joseph’s Church in Skerton which was left without power during the flooding chaos. The family have praised Father Philip and Deacon Stephen for performing the service by candlelight. The couple were devastated when they awoke on Sunday morning to find themselves without power and half of the city centre near-deep in water. Although flooding left the district stranded and motorway closures caused chaos 20 family members arrived to celebrate Roman’s birth. Susannah said: “We had no way of getting in touch with people, it was just a case of who turned up. After the service Roman was taken to his grandmother’s, Jadwija Escolme, on Halton Road, where the family gathered around a camping stove for cups of tea and cake. Jadwija was one of the lucky one’s to escape as the bottom of her road was left flooded. 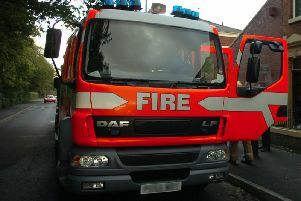 The couple are currently in North Wales until electricity is secure at their home on Wensley Drive, Lancaster.